You can't miss them, not in this flat valley, perched by the Great Western Railway close to where the line to Oxford turns off. The exposed nature of the site led to the CEGB commissioning architect Frederick Gibberd to do something a bit special to blend them into the landscape. 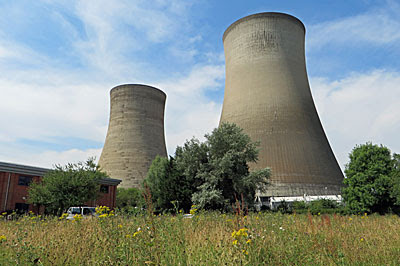 He designed a cluster of hyperbolic cooling towers, initially taller but reduced to 375 feet in line with decreed safety requirements. To get the composition right he undertook a visual study, shuffling around different numbers of towers of differing heights, before eventually ending up with two groups of three at opposite corners of the site. As of this morning, just one group remains. Yes, they're not all going, not yet. Three towers remain, these actually much easier to get close to thanks to a cycleway along the northern perimeter of the site. Take the path from Sutton Courtenay and pass by the landfill gravel pits to reach the edge of the remaining cluster, rising high beyond a line of trees and bushes. There is a mathematical elegance to their structure, the line on a graph writ large, ending at an open circumference in the sky. This close sometimes one of the trio disappears, masked by another, then peeks out from behind the rim as the composition shifts. They'll fall too before long, but for now this quiet byway is your access to close-up concrete contemplation. It's not so easy, sorry wasn't so easy, to stand in the vicinity of the three Southern Cooling Towers. 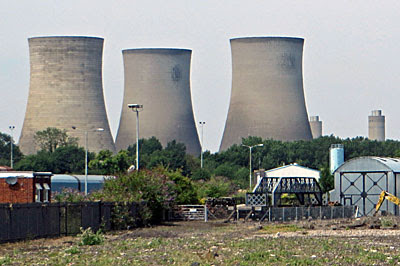 They stood in the Didcot corner, close to the main entrance and alongside the railway siding that brought in the coal. It's possible to wander a short distance down the access road to see the trio looming beyond the trees, but a sign reading 'Private Property' precludes getting any nearer. The southern perimeter road looks promising on a map but is shielded by an earth bank, so the closest vantage point turns out to be a small trading estate just up the road near the end of the footpath. All three towers can be spied across the car park, but only two from the scrubby meadow round the back. Sorry, could be spied, this new state of towerlessness is taking some getting used to. A demolition on this scale takes some organising, and the company responsible were already out in force at noon yesterday. Men in orange hi-vis were stationed at regular intervals along the surrounding roads, watching over the 'no waiting' cones, while a minibus of reinforcements emptied out to shift metal barriers across what might have been excessively tempting stretches of pavement. Had I turned up a few hours, or even minutes, later, I'm not sure I could have taken the shots I managed. But they were probably best seen from further away, as Gibberd intended, as three sculptures on the horizon. To that end the car park by the railway station afforded a very good vantage point, or indeed anywhere for miles around with an unobstructed view. The towers' explosive end was scheduled for between 3am and 5am this morning, which annoyed many local residents because pre-dawn on a Sunday is a fairly anti-social time, and they'd have liked to have watched the destruction with the sun above the horizon. But the demolition company were adamant - the towers are close enough to the Bristol mainline that dust from the collapse needs to be cleared from the rails before the first train runs through at seven, so before sunrise it must be. Perhaps they'll relent when the three northern cooling towers are toppled, which is currently scheduled for sometime next year. Because climate change and European directives wait for nobody, even gas-powered Didcot B looks likely to fall silent over the next few years. Energy may have made our island's fortune but it's no longer our forte, hence the gradual disappearance of the structures that powered our industrial past. 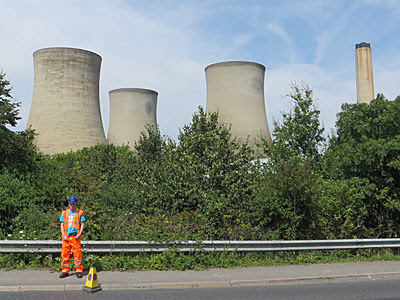 English Heritage considered listing Didcot's towers but decided there were better examples up north, hence down they've come and now some of the land can be reused. Those who live nearby may be pleased to get their valley back, unadorned, but for those who saw these giant hyperbolas as art, a journey through South Oxfordshire will never be the same again.